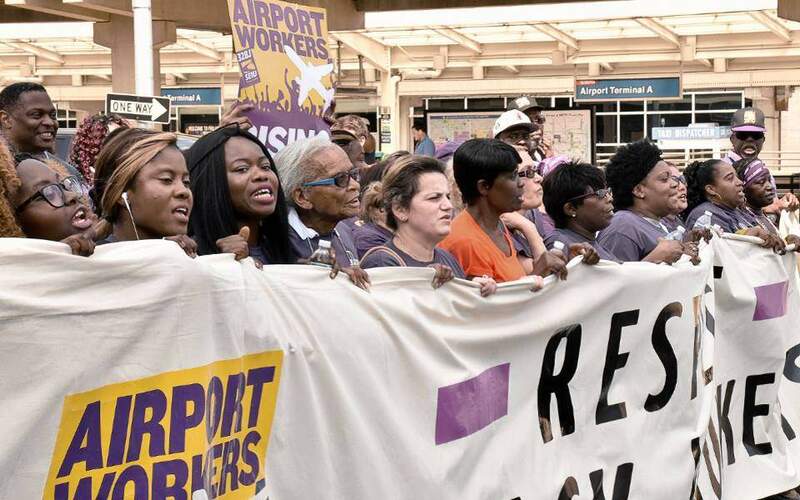 Over 600 workers and their supporters took over three of the four lanes of the departures roadway at the Philadelphia International Airport for two hours on July 19 as they walked from the A Terminal to the F Terminal. 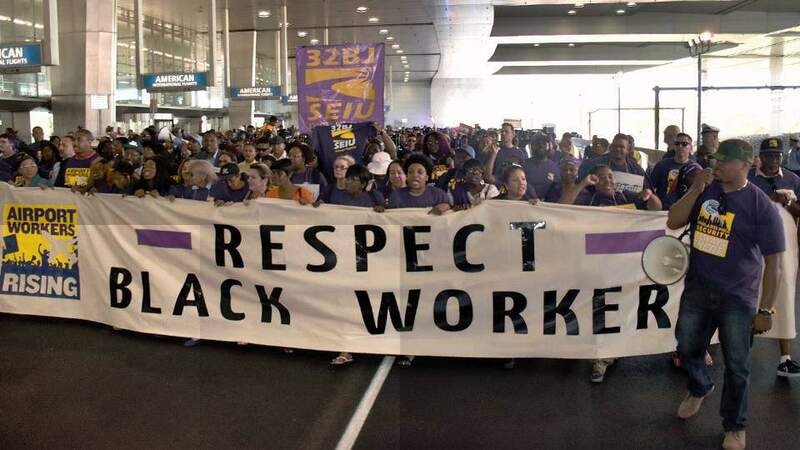 Marching behind a huge banner that read, “Respect Black Workers,” they demonstrated what might happen if up to 2,000 airport workers go out on strike during the Democratic Party Convention July 25-28. 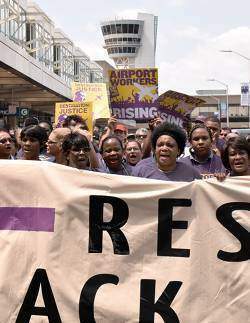 Service Employees Local 32BJ, which organized the midday disruption, bused in members from Virginia, Connecticut, Pittsburgh and New York to support the Philly workers, who include wheelchair attendants, skycaps, aircraft cabin cleaners and bag handlers. Many of those jobs used to be unionized, but the airlines have outsourced these positions over the last 30 years to Prospect, PrimeFlight, McGinn Security and other nonunion subcontractors. A large majority of the protesters were Black and Brown workers. They demand a $15-an-hour minimum wage, affordable health care, vacation days, better scheduling and the right to a union. Many women workers participated, leading chants, holding up the lead banner and giving speeches. 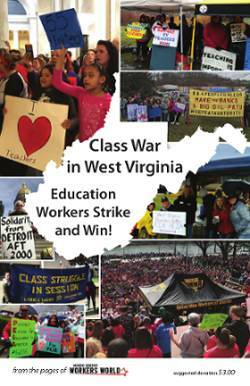 An earlier campaign that included four short strikes, numerous rallies and even taking over City Hall won workers an increase from $7.25 to $12.00 an hour, effective July 1, 2015. Now, the workers are demanding a minimum of $15 an hour, a union and respect. 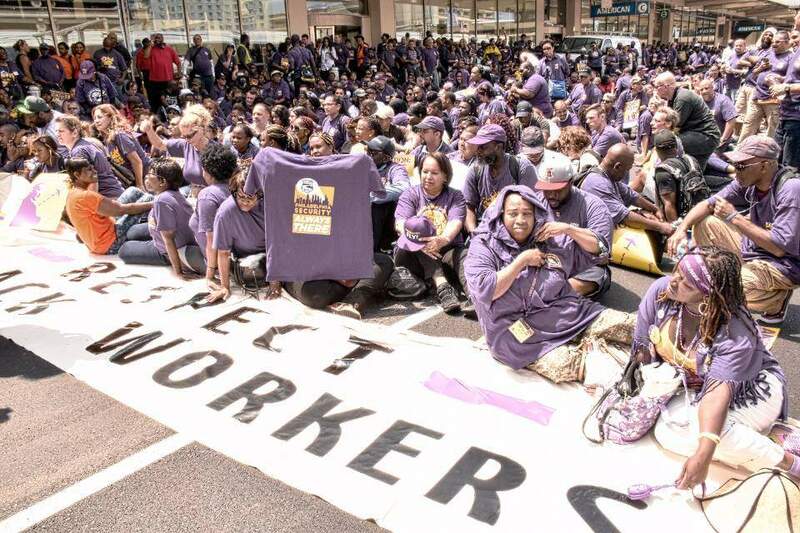 SEIU’s endorsement of Hillary Clinton for president hasn’t stopped the union from threatening to cause a major disruption during the DNC Convention. In addition to airport workers, taxi, limo and Uber Black drivers have also threatened to strike during the DNC.